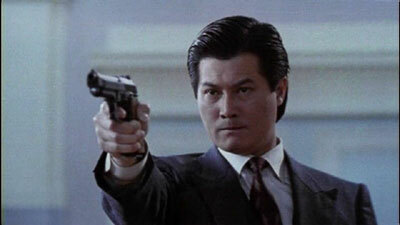 In the wake of films like A Better Tomorrow and The Killer came many movies who wanted to capture the essence of a John Woo-movie and also make a quick buck at the same time. I don't think Return Engagement will be considered a classic but it does have some positive things worth mentioning. Even if Wong Kar-Wai co-wrote this script, you won't find much originality here. The whole movie bears quite an resemblance to the films of John Woo, in other words a lot of violent shoot-outs and a good dose of melodrama. The difference here is that director Joe Cheung (Flaming Brothers) is not quite as skilled in either department. What about the positive aspects then? Well Alan Tang's performance is not too bad. He manages to handle the lackluster material with skill and creates a somewhat sympathetic and multi-layered character. The biggest surprise to me was May Lo. When she first enters the picture I feared that we were going to be stuck with an highly annoying teenage girl for the rest of the movie. But she is actually pretty good and she and her character develops rather nicely (considering the material) throughout the piece. Simon Yam is one of my favourite actors but here he's not blessed with a great script, so his baddie role doesn't require much really. 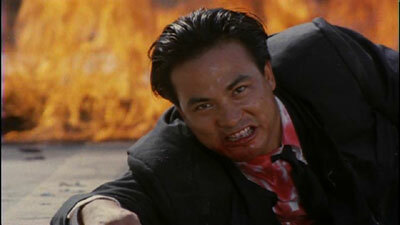 He is entertaining to watch though and it looks like he's having fun playing evil the way only Hong Kong gangsters can. Contrary to what the cover suggests, Andy Lau only has about 20 minutes of screentime. But he's mostly in the movies highlights: the crazy and violent shoot-outs. It's not really the balletic kind of action choreography that John Woo does that's on display here, but it's still very entertaining. Fans of the heroic bloodshed-genre should be pleased after the final frame of the movie. Return Engagement was made during an era I miss in Hong Kong filmmaking and I will consider it among the better John Woo-imitators. The picture is 1.78:1 anamorphic and I was surprised at the detail and black levels, considering it was made in 1990. What drags it down though is the requisite specks and marks but also some weird large yellow spots during some parts of the film. Kind of distracting to be honest. The disc comes with Cantonese and Mandarin audio options, both in Dolby Digital 5.1. It wasn't too badly done in terms of remixes but I had to turn my center channel up a few notches so that the dialogue would be properly centered. The dvd also includes an English 5.1 track, something Megastar has done on a few titles lately. The English subtitles contained the usual spelling error or five but all in all perfectly satisfactory for this kind of movie. Traditional and simplified Chinese subtitles are also included. The disc has no extras whatsoever, not even the theatrical trailer. Boo!